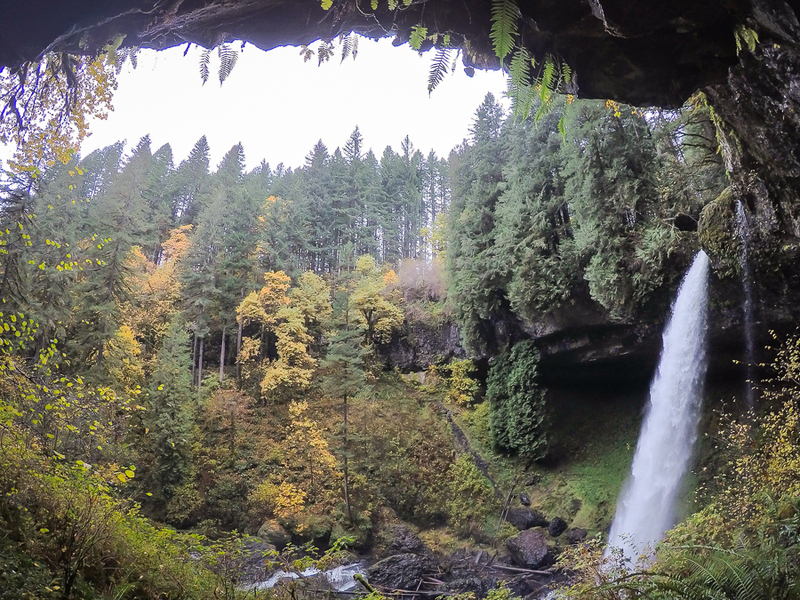 Located an hour and 15 minutes from from Portland, Silver Falls State Park is the place to go for an all day hike passing by 10 waterfalls. The trail is flat, easy, but still very scenic as it follows alongside the creek most of the time. One of my favorite things about this hike is you can go behind several of the waterfalls, and this area is especially beautiful in the fall time. You can start at either the South Falls or North Falls parking lot. When coming from Portland, I hit the North Falls parking lot first, and parking here requires a Northwest Forest Pass or 5$ in cash (exact change). When you head down the stairs towards the falls, you'll reach a junction to either start hiking clockwise on the Rim trail or counter-clockwise on the Canyon Trail. I was eager to see North Falls first, so I headed north on the Canyon Trail. After passing behind and around the falls, a mile down the trail is Twin falls. Another 0.4 miles later, you hit Middle North Falls, my favorite waterfall in the park. There's a side trail that heads behind the waterfall, and it's one of the widest waterfalls in the park. My favorite waterfall in the park! Just downstream is Drake Falls, and then the side trail to Double Falls is on the right. Although several of the waterfalls in the park can only be seen from a distance or from a viewing platform, you do get to walk behind 4 of the larger falls in the park. In between falls, the area is still lush and colorful. Even when it started raining, the foggy mist added to the Pacific Northwest vibe, and it worked out since I only saw a handful of people on the trail. You can also drive along the 214 and get to several waterfall viewpoints and trailheads that access the loop instead of hiking the whole thing: South Falls TH, Winter Falls TH, and North Falls TH.